A “coworking space” is a shared, collaborative workspace as well as a place for working people who would like to obtain certain business services or expand their professional network. Whether for freelancers, telecommuting employees or start-up companies looking for a temporary premises to work on their project, coworking spaces offer an attractive alternative to the standard office. 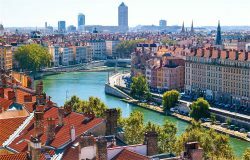 Lyon is Europe’s 10th most attractive city. It’s no wonder that the number of coworking spaces in the Lyon metropolitan area is on the rise. The need for flexible, mobile workspaces continues to grow every year. Whatever the sector, from industry and services to digital and R&D, Lyon is an ideal city for innovation and building professional relations, thanks namely to the shared, collaborative workspaces located here. 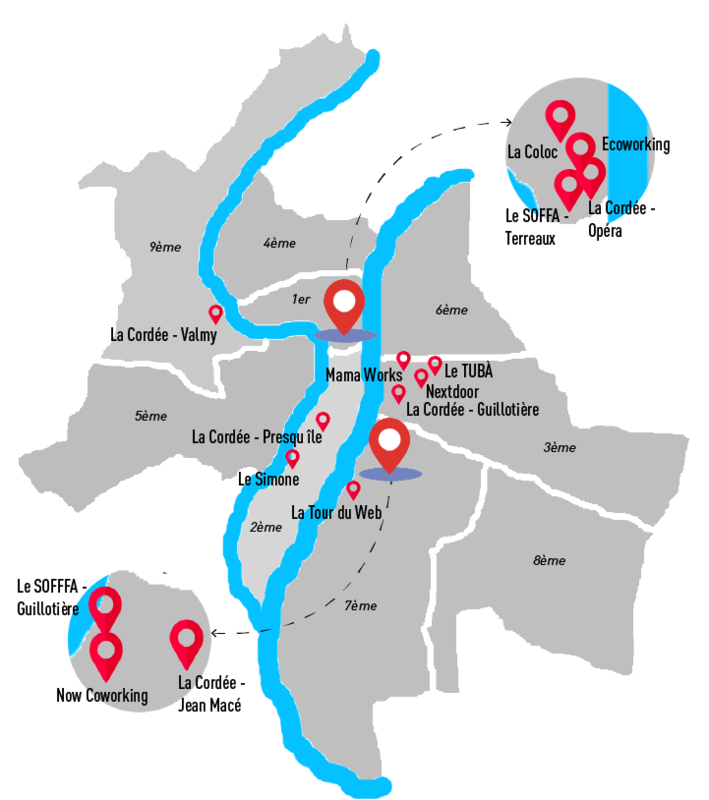 La Cordée offers several coworking spaces in the Lyon metropolitan area. First of all, in the Opéra neighborhood in the 1st district of Lyon, the la Cordée coworking center is located on the quay of the Rhône, featuring a bright, friendly, open space with a kitchenette, two meeting rooms, and a shower. La Cordée also offers 24-hour access with Wi-Fi, printers, unlimited beverages and advice from experts at theme-based workshops. With a mezzanine, a terrace, a creativity room, an industrial workshop and several meeting rooms, the second la Cordée coworking space is located in the 7th district. You can also find other la Cordée spaces at Perrache, Liberté, Valmy and Charpennes. La Tour du web is a 2,500 sq. m. building located in Lyon’s 7th district. It is a collaborative workspace dedicated primarily to the digital industry. Here, you will find entrepreneurs and start-ups, as well as a number of web companies. At La Tour du web, the shared space is located on the ground floor and features a kitchen, a Foosball table, and free access to two meeting rooms, Wi-Fi and printers. It offers a standard membership with a permanent workstation or a hot-desking offer with access to the coworking space. Now Coworking is located on the top floor of the Citroën building in the city’s 7th district. Formerly the world’s largest garage, the building has been listed as a historical monument. Now Coworking offers more than 80 private or shared offices as well as meeting rooms in each of its three 1,000 sq. m. work areas. This coworking space can accommodate up to 350 people. Some workstations allow you to work near large picture windows with lovely views of the city. When you choose Now Coworking, you can also take advantage of special conferences, a Ping-Pong table and a gym. There is a standard membership and a hot-desking membership offering access to the full range of services. Located near Place des Terreaux, le SOFFFA is both a coworking space and a café. Featuring an events room and an area dedicated to homemade cookie recipes, this hybrid workspace offers you a “Slowcafé” service, with rates by the hour, the half-day or the day, as well as a monthly membership with 24-hour access. In addition to its premises in Lyon’s 1st district, Le SOFFFA has recently opened a new space in the Guillotière neighborhood in the 7th district. Discover Ecoworking, located in the heart of Lyon’s 1st district. At this ‘green’ coworking center, visitors and members comply with the space’s environmental charter. You can find storage for your bicycle, free-access kick scooters for emergency trips and pooled delivery services. Ecoworking offers both half-day rentals and monthly memberships. Seeking a coworking space where everything is shared? Head over to la Coloc’. Located in the 1st district of Lyon, la Coloc’ offers you a coworking space accessible during the daytime, as well as offices for rent on a monthly basis. One original feature of la Coloc’ is that it has a mini shop, called Débarrasoeurs, where you can buy and sell second-hand clothing and shoes. As well, there are plenty of hot drinks and even regular DIY workshops. TUBÀ is a Lyon-based living lab specializing in the digital sector. Located in the 3rd district, it offers a coworking space where you can innovate, experiment and talk with the other professionals on hand. Founded by a non-profit organization, Lyon Urban Data, TUBÀ features a large work area on the first floor with hot drinks and a Ping-Pong table. As well, there is an incubator and an exhibition/conference room. Nextdoor is a coworking space that is part of the Bouygues Group. With over 5,000 sq. m. of floor space near the Part-Dieu train station and mall, Nextdoor offers private offices and hot-desking, as well as meeting rooms in Lyon’s 3rd district. Recently opened (at the end of 2017), these new workspaces offer daily rates, hot-desking rates and monthly rates with the Nextdoor Pass. Le Simone is another Lyon coworking space where people get down to serious business in a café-style setting. It is located in the heart of Lyon, in the 2nd district near the Perrache train station. With a capacity of 45, le Simone hosts you in a friendly space equipped with fiber optic Internet, a meeting room and a café. It also features conferences, exhibitions, evening parties, festivals and free training sessions. The Mama Shelter hotel chain opened its first coworking space, Mama Works, in 2017 in the heart of the Part-Dieu business district. Aiming to revolutionize coworking, Mama Works offers 7 different types of rates to meet your needs. In addition to standard services such as Wi-Fi, meeting rooms, and unlimited coffee and tea, the space also features a designer office supplies shop.